the moment i have been waiting for is FINALLY here: it is time to reveal ALL the details of my cookbook, bake the seasons. it has been so hard keeping everything a secret since i began writing it last year. if you know me at all, you know i am terrible at keeping things hush hush. especially when i am this excited! i am just so thrilled (maybe a little nervous too) for bake the seasons to be released to the world. the official publication date is april 2nd, 2019, BUT pre-orders start now (so pre-order yourself a copy!!!). for those who pre-order the book, i have some fun giveaways lined up, which i will be announcing on my social accounts in the next few weeks. i have also launched the cookbook page on my blog, which tells you everything you need to know about the book + where you can order it. however, below are a few details & never before seen images from the book. the book is very similar to my blog, in that it features simple + seasonal recipes that use minimal ingredients. the book is almost all new never before seen recipes, but I did have to sneak in 1 or 2 modest marce classics that I couldn’t possibly leave out of my first book. the book is entirely a baking book, but contains half sweet & half savoury recipes. for the sweet section think cakes, pies, tarts, scones, muffins & breading pudding. for the savoury section think pizza, biscuits, bread, pot pies & pretzels. enjoy the very first peak into the book! i can’t wait to show you more as the publish date creeps up on us. with how fast fall has gone by, spring will be here before you know it. i hope you love bake the seasons as much as i do! so.. what's in the book? how to stock your pantry to make seasonally based baked goods. how to shop local produce & eat seasonally. what recipe is on the cover? 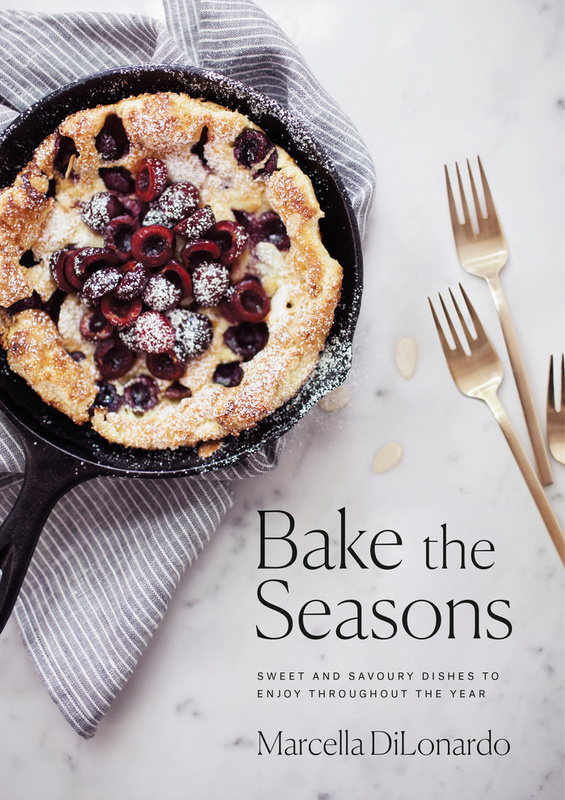 the recipe to grace the cover is my cherry almond dutch baby, which is featured in the spring chapter. the book is divided seasonally into four chapters (spring, summer, fall & winter). this idea was inspired by the gilmore girl revival, which was launched in seasons as well!